Now that spring is blooming, the White House Rose Garden–the most prominent horticultural display on the grounds of the Presidential mansion–comes to mind. Bordering the Oval Office and the West Wing of the White House since 1913, the White House Rose Garden has long been the setting for official presidential business: hosting special visitors, conducting official ceremonies, making public statements, and more. 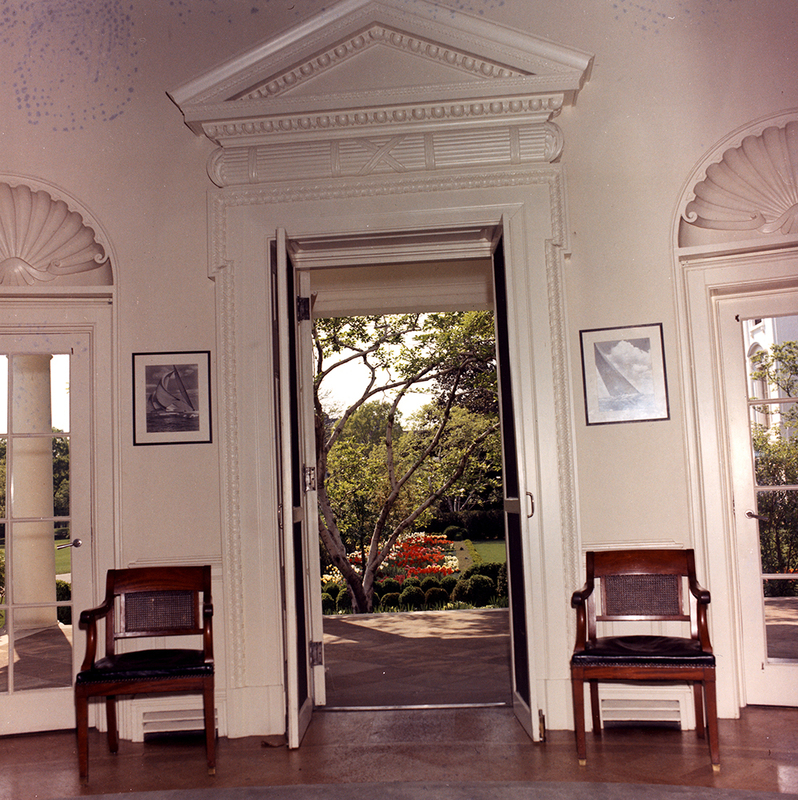 It has also served as an elegant yet informal space for the private use of presidents and their families. 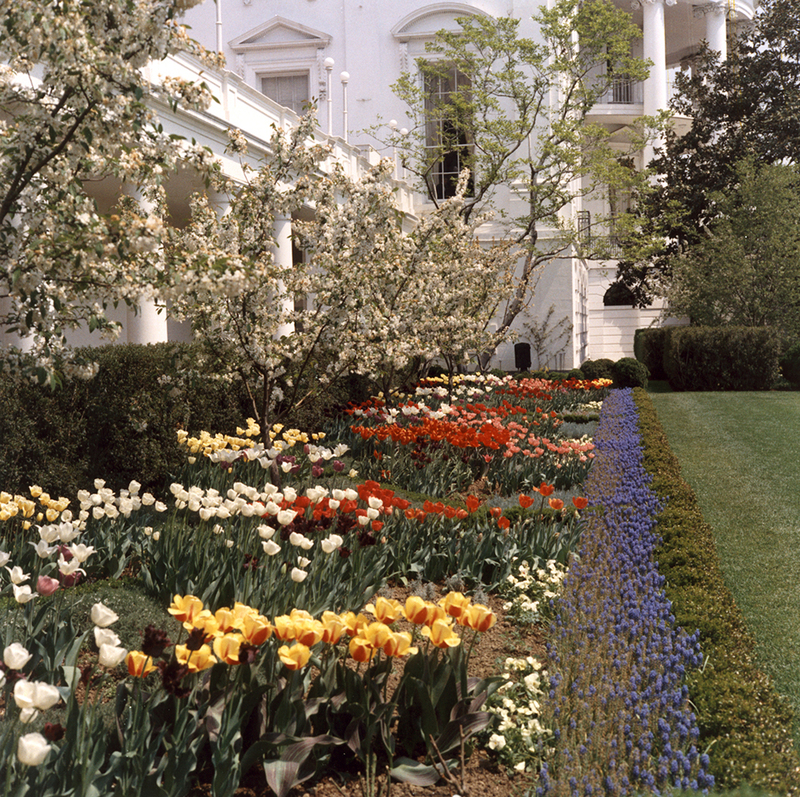 During the Kennedy Presidency, Mrs. Kennedy, as part of her sweeping White House restoration efforts, set about transforming the Rose Garden from a “nondescript patch of hedge-rowed lawn” into a space with a defined central lawn bordered by flower beds planted in a French style; it would feature American botanical specimens including crab apple trees, tulips, primrose, and grape hyacinth. The physical transformation was led by Mrs. Kennedy’s friend Rachel Lambert (“Bunny”) Mellon, wife of philanthropist Paul Mellon. Despite not having any formal landscape training, Bunny Mellon had a vision for the Rose Garden that was compatible with the First Family’s desire for a stately and inviting outdoor stage for both public and private activities. JFKWHP-KN-C28009. 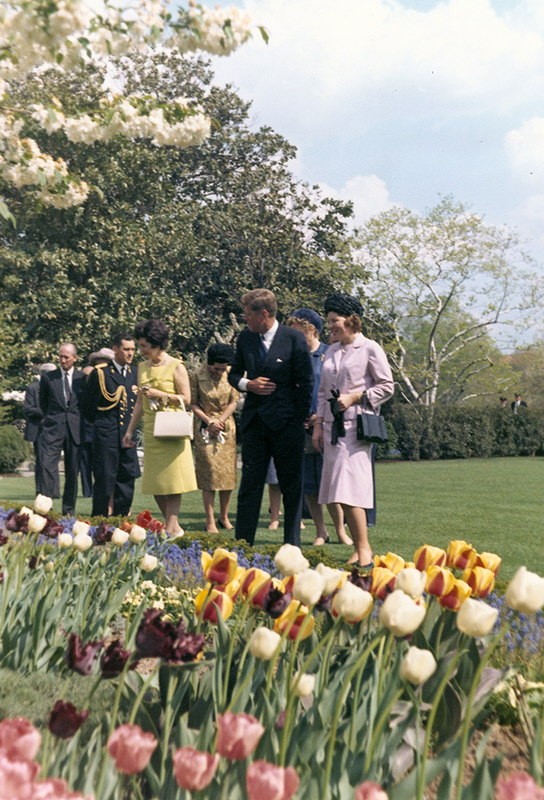 Tulips blooming in the Rose Garden of the White House, April 1963. JFKWHP-ST-A1-1-63. Princess Beatrix of the Netherlands visits the Rose Garden of the White House after a luncheon in her honor, 18 April 1963. Bunny Mellon died on March 17, 2014 at the age of 103, an event prompting considerable activity in the Kennedy Library’s audiovisual reference unit, particularly with regard to requests for images of Mrs. Mellon and the Rose Garden restoration project. The audiovisual reference team was unaware of any such images, until recent interest prompted a closer look at one image in particular, KN-20842. Research confirms that the woman standing in the background is Mrs. Rachel Lambert “Bunny” Mellon. JFKWHP-KN-20842 (edited). 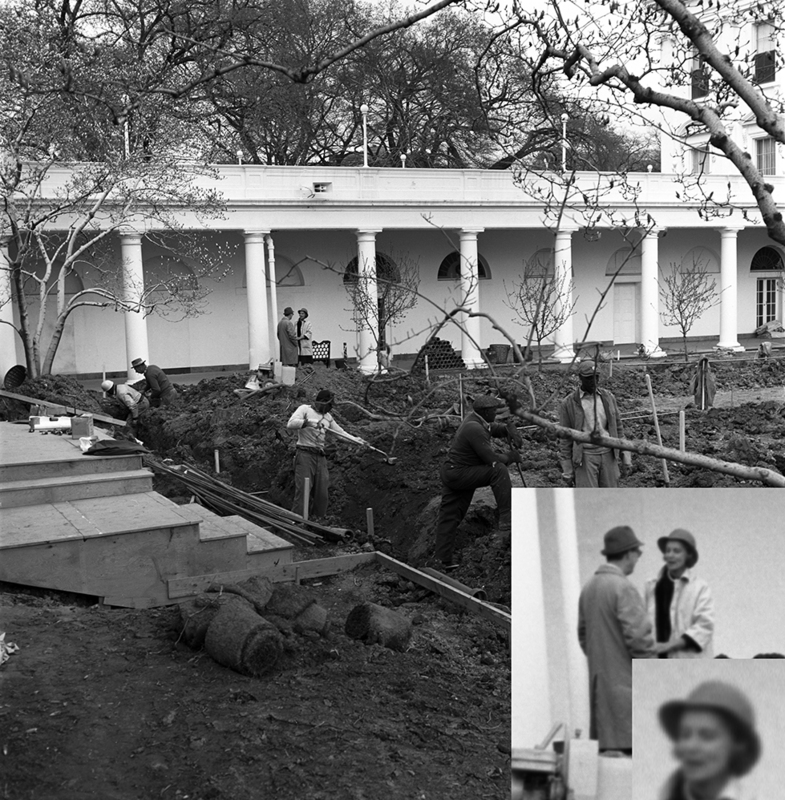 Rose Garden construction progress photo, with superimposed close up of woman (Bunny Mellon?) featured in background, 4 April 1962. The restored Rose Garden offered President and Mrs. Kennedy a beautiful venue for holding events; it also brought joy to family members including young John F. Kennedy, Jr. It still brings joy to many. Mrs. Mellon’s garden continues to invite its visitors to stop, and smell the roses… and all of the other flowers, too. JFKWHP-ST-C112-1-63. 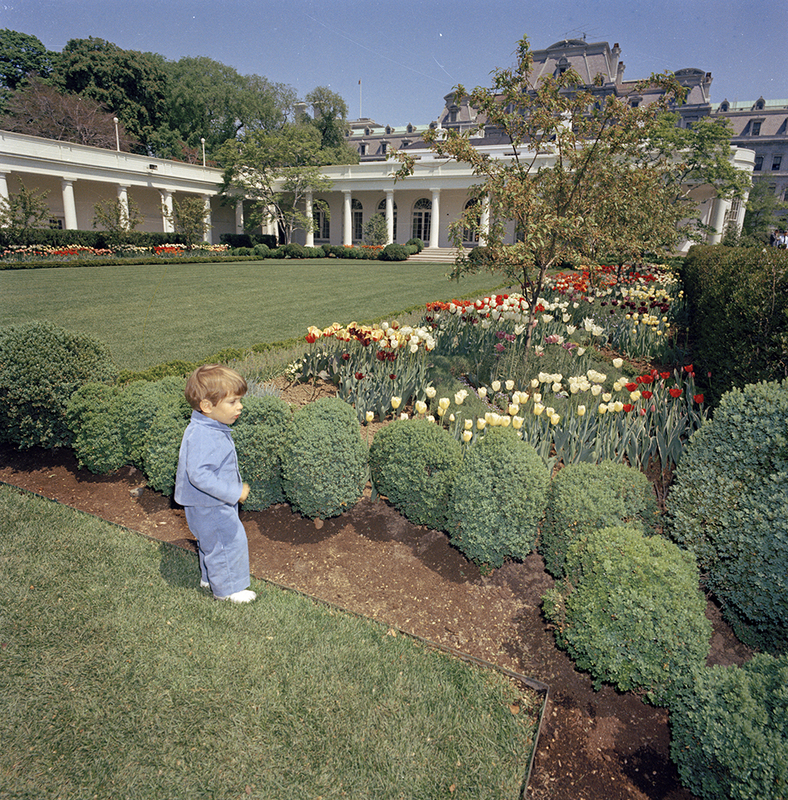 John F. Kennedy, Jr. in the Rose Garden, 26 April 1963. Abbott, James A. and Elaine M. Rice, Designing Camelot: The Kennedy White House Restoration (New York: Van Nostrand Reinhold, 1998), p. 9. ← The Kennedy Library Joins GoodReads!